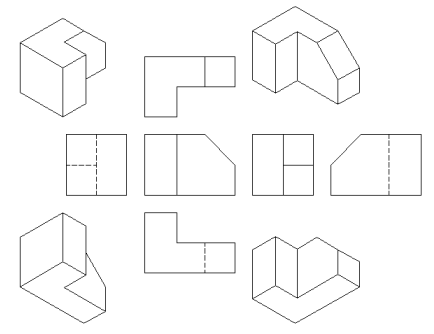 Generates associative orthographic and isometric views of 3D models in paper space layouts. Note: This command launches only in model space. Preset: "None", View scale: "Adapt to paper size"
Selects the entities in model space from which to generate the drawing views in a layout tab. Select all the 3D entities in model space. 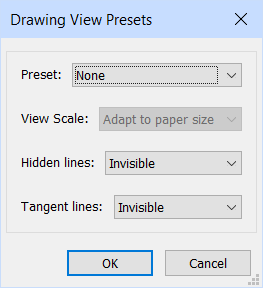 Specifies the types of generated drawings and their placement in the layout; displays the Drawing View Presets dialog box; see below. The selected preset is saved through the DRAWINGVIEWPRESET system variable. To create exploded views, use the bmExplode command; before this command can be used, the drawing must have inserts of mechanical components. 9 views - adjusts the scale to fit five orthographic views and four isometric views. 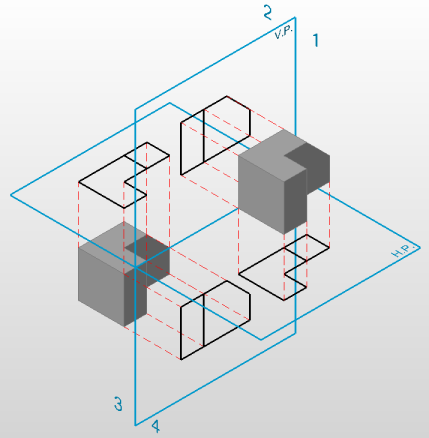 5 views - adjusts the scale to fit five orthographic views: Front, Top, Left, Right, Back. 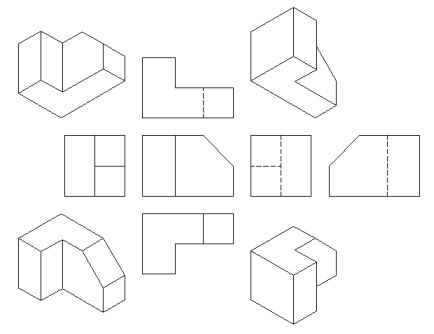 10 views - adjusts the scale to fit six orthographic views and four isometric views. Standard scales - displays the scale list as maintained by the ScaleListEdit command; select a scale from the list. Custom - prompts you to type a scale in the command bar. 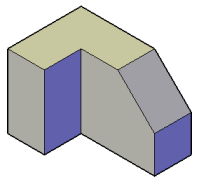 Tangent edges are always created for isometric views. 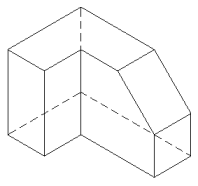 Freeze or switch off the display of the BM_Tangent_Visible layer to hide tangent edges in isometric views. Defines the base view. 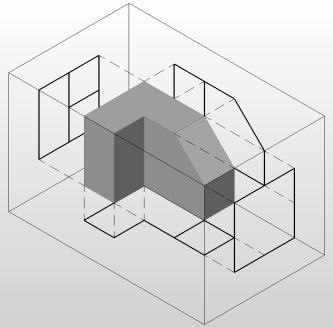 Rotates the 3D model so that the main view is projected on the vertical projection plane (V.P.). Select orientation [Front/bAck/Left/Right/Top/Bottom] <Front> - enter an orientation to change the base view. 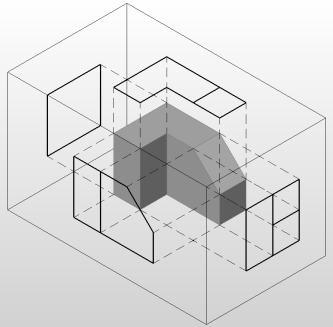 3D views - draws isometric views as 3D solids with the Conceptual visual style applied. 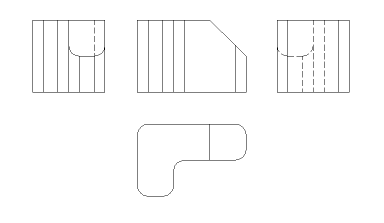 Depending on the position of the cursor with respect to the base view one of five orthogonal views (top, left, right, back and bottom) and four isometric views can be inserted. The views are aligned automatically. Tap the Ctrl key to toggle alignment on and off; when off, you can place the current view in any location. When the GENERATEASSOCIVIEWS variable is on, associative dimensions are updated automatically when the 3D model is modified. The layout of the mechanical views is controlled by the projection type: first or third angle. The current projection type is saved in the PROJECTIONTYPE variable. The scale list can be edited by the ScaleListEdit command. MvSetup - creates multiple paper space viewports; aligns, rotates and scales paper space viewports. 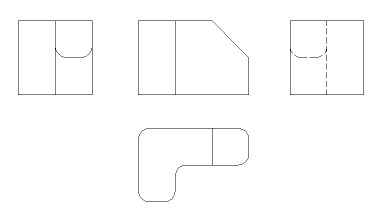 In model space the command creates a rectangle, representing a paper sheet with respect to a specified scale. ViewSection - creates a cross section view based on a standard drawing view generated by the VIEWBASE command in a paper space layout.